Pronunciation, expanding vocabulary, forming simple sentences. The 1st step towards competent fluency. The learner gains confidence by increasing his vocabulary, practicing basic patterns, by beginning to read and understand words and sentences in English. First step for learners who wish to hone their communication skill. To provide enhanced communication skill so that participants can hold a lively conversation with improved vocabulary and grammar. Refine your speaking style and improve from pregnant pauses to easy fluency in the use of English Language. Participants who have completed Step-1 & Step-2 and wish to fine tune their English to levels of high competency. The course covers the four skill areas of Listening, Speaking, Reading and Writing which directly correspond to the four modules making up the test. Preparatory courses for both General Training and Academic modules are offered. Training in reviewing and self-evaluating test performance. 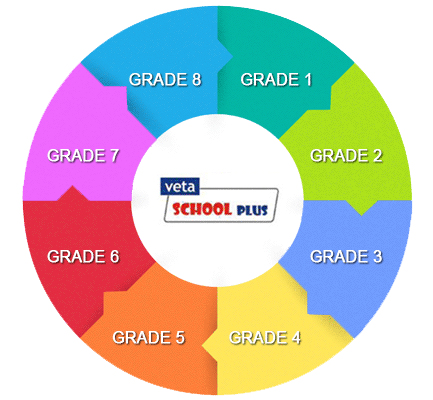 What is veta school plus? A quality based English language training for schoolchildren. What will you get from veta? What did miss ask you to do? What did miss ask? What did miss say? Catch them young and enhance the level of fluency in their spoken English to match the most competent speakers across the country. At school English is taught as a subject. At Veta the skill of using the language as a communicative tool is inculcated. Young learners pick up the skill quite smartly and become as good as the best speakers of English in their age group, across the country. For the age group 10-14 year. This programme is for children in classes of 5,6 and 7. Admission is based on a diagnosis done by the teacher, and not by the class in which the kid is studying. A kid from class 7 who has a good knowledge of English may be admitted to a level higher than this. Enrolment is based on competence.